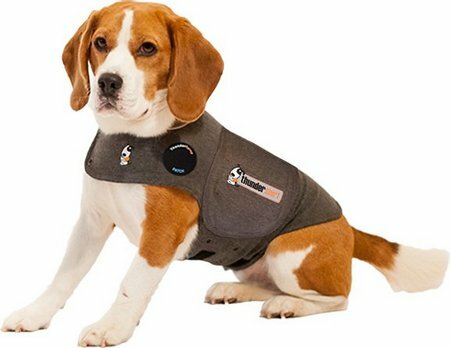 Thundershirt Reviews & Guide : Solution For Stressed Dogs? 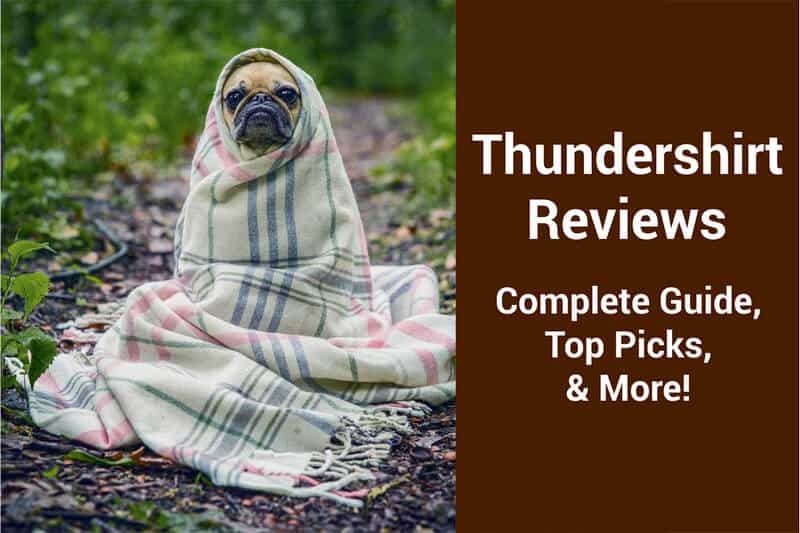 Home REVIEWS	Thundershirt Reviews [2019 Edition]: Complete Guide, Top Picks, & More! No dog is immune to anxiety attacks. In fact, there’s a bunch of things that could trigger one. What is most interesting is the fact that some of the anxiety triggers in dogs may sound a bit weird to humans. But to your canine friend, they are very real. For instance, your dog might get all anxious when you have a new visitor(s) over or when you introduce a new mutt to the family. When your little friend has to share food with the new pup all of the sudden, that might not sit well with her either. Your dog’s anxiety could also be brought about by storms and the resulting thunder or loud noises. Usually, your dog will most likely find relief when she gets some reassurance from you that things are fine. Unfortunately, you won’t be around all the time. Ever heard of a thunder jacket for dogs? That’s precisely what can make a significant difference towards providing that reassurance and easing your dog's anxiety whether or not you are around. Later in the article, I will take you through some thundershirt reviews to aid you in choosing the right one for your anxiety-prone pup. But in the meantime, let’s find out if these thundershirts really work and how to select the right one for your dog. Does A Thundershirt Really Work? The answer is a definite yes! At least for a majority of satisfied pet owners who’ve been lucky to try these fabrics out. On platforms like chewy.com, you’ll find numerous doggy parents sharing how wonderful this product has been to their anxiety-prone pups. Also, you’ll come across a few who have registered little to no change. Either way, it would be helpful to learn as much as you can about thunder vests before you make the decision to give it a try. Normally, a thunder vest is constructed using stretchy, breathable, and comfortable fabric and with a design that allows efficient fastening. What makes it more functional is the ability to deliver constant gentle pressure on your dog in the right places to provide reassurance. To discover which option is right for your dog, speak to your vet. Actually, if you suspect that your pooch might be suffering from some sort of anxiety, it would be best if you take her to see a vet in order to have a proper diagnosis. If the anxiety is the kind where she gets overexcited during storms and thunder, your vet might recommend a specific type of vest for her situation. In some cases, your vet might offer additional anxiety treatment using drugs in addition to a thunder vest. Note that buying a vest without your vet's prescription might work, but it is likely to work better if you work in conjunction with him or her when addressing anxiety cases in your pooch. As I examine some thundershirt for dogs reviews, you will realize that an estimated 80 of pooches respond positively to well-constructed thunder vests that can deliver gentle yet persistent pressure on her body. Does A Thundershirt Work For Barking? Dogs bark for many reasons. As a matter of fact, your pooch might bark nearly all the time, given that barking is their primary way of communication. That said, some dogs can bark excessively, which signals a problem or anxiety. As mentioned before, consulting with a vet is always the best call as it increases the chance of a correct diagnosis and therefore a solution that is informed and likely to address the problem. A vet is able to determine whether the excessive barking is a result of other non-anxiety related issues or whether it is indeed connected to anxiety. If the barking is connected to anxiety, then he/she might determine the use of an anxiety vest as appropriate to help address the anxiety. They may also determine whether drugs are necessary for the best outcome. Well, many doggie parents have been asking whether the thundershirt works for barking and the answer is: it depends. In essence, it would be pointless to dress your little friend in a calming vest because of excessive barking that is not connected to anxiety. However, if the excessive barking has a connection to your dog’s anxiety, then the thunder vest may be helpful. The only sure way to know this is by working closely with your vet. There are a few things to take into consideration while choosing a thunder vest for your canine friend. Key among them is that they should be easy to put on your pooch. More importantly, the fastening mechanism should be simple and effective. Remember, the vest works because of its ability to apply constant pressure to your mutt’s body. Why is this fact important? If you have seen babies stop crying or remain calm when swaddled with a blanket and wondered why, it is because they feel safer and reassured by being wrapped up snugly. The thunder vest works in pretty much the same way—your pooch should feel swaddled and reassured in it. The type of fabric used for construction also plays a vital role in ensuring comfort. A fabric that is able to stretch and is breathable provides better relief. Actually, it’s this comfort that might make the difference between your pooch taking to the vest or rejecting it. 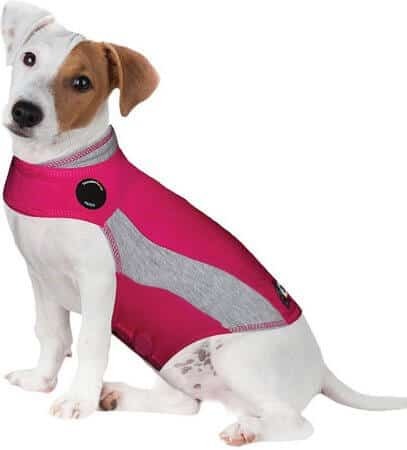 Additionally, if you would like to know where your buddy is in the dark, you can opt for a thunder vest that has piped reflective lighting Also, be sure to choose the right fit for your pooch's size and body type. For the best outcome, a thunder vest should have a snug fit. Lastly, It's important to note that these shirts should not be used on puppies due to skeletal growth concerns. As promised earlier, here’s a roundup of the best thundershirts for dogs available today. Although not all mutts are scared of thunder, storm, fireworks, and other large sounds, your pooch could be among those that completely lose their cool when any of these events strikes. It would be fair if you got them the ThunderShirt Classic Dog Anxiety Jacket that boasts an 80% success rate in dealing with that. 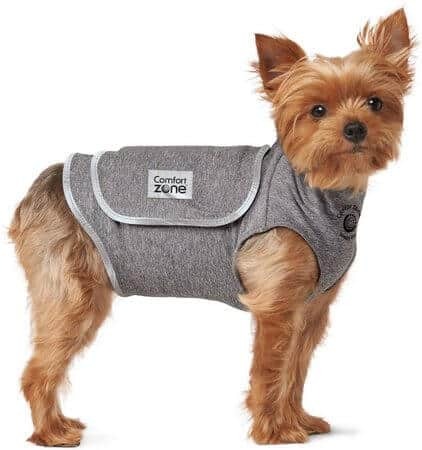 What’s more, the ThunderShirt Classic Dog Anxiety Jacket’s easy-to-wrap design makes it a snug fit and very effective in applying constant pressure to your pooch's body for comfort and reassurance. Also, the jacket is made out of soft breathable fabric to enable your pup to enjoy a constant cuddle for longer hours without feeling stifled. Something worth mentioning is that the fabric is also stretchy, making it very easy to get your dog into it. If you’d love to give it a try, visit chewy.com to place your order. 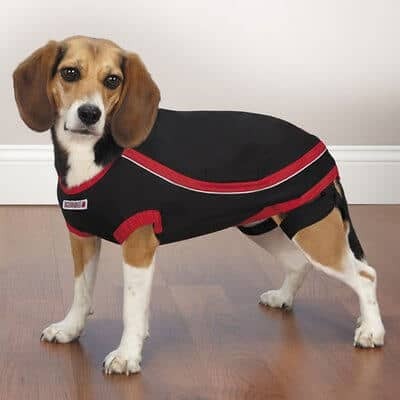 ThunderShirt Polo Dog Anxiety Jacket is very popular among pet owners and continues to enjoy a great reputation mostly because of its clever design. 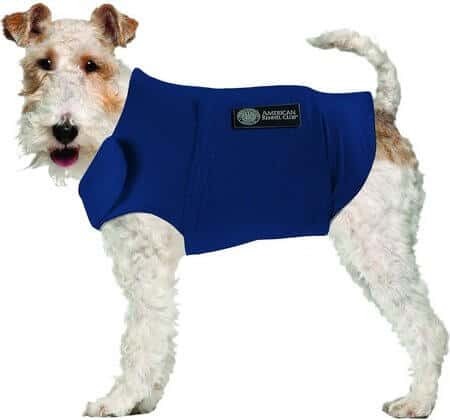 It’s easy to get this thunder vest onto your pooch and because it fits snugly, your dog won’t shake it off easily; in fact, once she gets accustomed to wearing it, everything else will be a breeze. One other thing I’ve come to admire about this vest is the exceptional ability to offer adequate constant pressure that helps dogs feel comfortable and less anxious. Its calming effect is comparable to what swaddling a baby does. Another feature worth mentioning is that the fabric used on this thunder vest adopts a four-way stretch design, plus it’s breathable and soft for enhanced comfort. Beyond helping with over excitement from thunder and storms, the vest also helps in other types of dog anxieties such as separation anxiety, vet visits, and travel. ThunderShirt Polo Dog Anxiety Jacket is available at chewy.com and retails at a friendly price that you won’t find elsewhere. Earlier this year, Comfort Zone® Calming Vest won an award for ‘product of the year’ in the dog care category. That alone speaks to the confidence consumers have in its exceptional ability to take good care of their dogs. This vest draws inspiration from swaddling. It adopts this age-old practice into the design, a fact that has enabled the company to come up with a vest that can soothe and calm dogs with the same precision experienced through swaddling. Having your dog wear it is easy as the process has been summed up in three steps. Besides, the vest itself is lightweight, flexible and breathable, making it pretty comfortable for your dog to wear and move around in. The addition of reflective piping should be good news to the pet parent who really cares about the safety of their pet as well. No matter the anxiety trigger, this vest comes ready to protect your pup from it. Be it fireworks, thunderstorms, or even separation anxiety, you can trust the Comfort Zone Calming Vest to do its job to your satisfaction. Discussions revolving around thundershirt reviews in separation anxiety forums and videos also speak to the greatness of these vests in handling the most complicated forms of anxiety. If you’d love to get one for your pup, chewy.com is the trusted and reliable online pet store I would recommend. AKC’s calming coat also borrows the swaddling methodology. It constantly applies pressure on your pup’s torso thereby generating the calming effect your dog needs to stay anxiety-free. One special thing about this coat is that your pooch can wear it in any situation, whether it's during fireworks, traveling, thunderstorms, vet visits, you name it. Whichever the event, she will still feel safe with this vest on. Thanks to the fuzzy fastener strips and simple design, dressing your pup in this coat will be quick and easy, plus she can have it on for as long as necessary. Make sure you select the right size for your pet while shopping because online stores like chewy.com tend to offer a variety of sizes to match your dog’s breed and age. Kong’s Anxiety-Reducing Pet Shirt sets itself apart by attempting to kill two birds with one stone. While it helps to calm down your distressed dog, expect it to also correct the bad behaviors linked to anxiety such as obsessive licking and chewing. Made out of polyester and spandex, this shirt also boasts a wrap-around design that fits snugly thus enabling it to effectively soothe your stressed and anxious dog. Other design features that add to its functionality include removable hind leg straps and an adjustable fastener. Unlike the other shirts, Kong’s comes with a built-in lavender sachet. Known for its aromatherapeutic properties, the scent adds to the calming effect, particularly during stressful situations like fireworks, thunderstorms, vet visits and so on. KONG Anxiety Reducing Pet Shirt comes in various sizes to suit your dog’s size. For a better shopping experience, place your order at chewy.com. Even if you don’t have one yet, at some point in your dog’s life, you are going to need the help of thundershirts. I’ve come to really appreciate the role they play in calming down a dog and making them feel safe. It’s one of the best things you can actually do for her given the many anxiety triggers around us. As mentioned earlier, excessive barking and other serious symptoms should be left your vet as they are able to correctly figure out the reason behind such conditions. Meanwhile, the thunder vest reviews above should give you a good head start as you seek to take good care of your anxiety-prone dogs. You’ve probably noticed that all of these thunder jackets boast excellent design features that have also received great compliments from pet owners already using them. Therefore, you have no reason to doubt that you are making a great decision about getting one for your dog.